In 1907 the Park Club was constructed, a two-and-a-half­storey, eleven-room, frame structure on 4 Park Street East for smelter and office workers. In 1911 two residents were Rupert M. Macaulay Superintendent of Mines The Canadian Copper Company; and A. T. C. MacMaster Engineering Assistant Canadian Copper Company. Mrs. M. Williams was the Housekeeper. In 1914, D. Dole was Manager. Ella Johnson, a waitress lived at 2b Graham Street in 1916. In 1920, R. J. Meggs was Club Manager. The Club was in operation in 1930. The Algoma Club was at 12 Park East. In 1914 C. A. Bell was the Manager of the Algoma Club. Residents were R. M. Asselstine; F. J. Bedford; C. H. Buskard; W. Dunn; E. Futterer; Hy Keast; Wm Kindjcore; W. McLaughlin, A. C. Mason, C. E. Oliver, W. Phelan, and J. B. Vandecar. In 1916 Miss Shannon was the Manager of both the Algoma and the Engineers' Clubs. In January of 1917 the Algoma Club was closed for the winter. From 1918 to 1919 Hugh F. O’Neil was Manager. In 1920 Mrs. Mary White (widow of Edmund) was Proprietor, followed by Daniel Kelly from 1921 to 1922. The Algoma Club was for salaried employees. It was in operation in 1930. At about the same time the Engineers' Club was constructed at 14 Park East for hourly rate employees. In 1914 residents were John H. Alden; Hans Frisak; Frank M. Gaiger; Jas M. Jenkin; Keith L. Newton; Frederick J. Patchell; R Knox Paton; and Leslie A. Williams. Richard M. Coleman was Manager; George Sewell and Stanley Snelling were Waiters; and K. Spencer was Chef. In 1916 Mary C. Shannon was Manager, and Miss Reg Sheedy was Assistant Manager. From 1918 through 1920 Miss C Shannon was Superintendent; and from 1920 to 1921 Mrs. P. McNicholls was Superintendent. The Central Club was located at 95 Copper Street. In 1911 Flora Mackenzie of 8 Oliver Street and Florence McKenzie of 73 Balsam Street both worked at the Central Club. Residents were George M. Ferguson Chief Sampler at the Cobalt Plant; Samuel G. Hill Timekeeper Cobalt Plant; Herbert Robson, Stenographer Canadian Copper Company; Peter R. Ross Timekeeper Canadian Copper Company; Thomas H. Rowe, Clerk, Canadian Copper Company Harry F. Sefton Clerk Canadian Copper Company; and Harry S. Vickerson, Foreman Electrical Department Canadian Copper Company. In 1916 Thomas Scott of 20 Serpentine Street was the Club Manager. The Matte Club was at the corner of Park and Oliver Streets. In 1911, residents of the Matte Club were James D. Cummings, Engineering Assistant Canadian Copper Company; William Kent General Foreman Converter Building Canadian Copper Company; Donald McGaskill; and Charles Mason. Mrs. S. W. Sommers was Housekeeper. The Smelter Club was at 131 (later 21) Rink Street. From the 1911 Census of 131 Rink Street, Copper Cliff, Walter Brayburn, age 45, born in England, immigrated in 1882, Plumber for the Copper Mine, employed for 52 weeks earning $1500. ; Lodgers were Roy Barnes, age 25, born in Ontario, English origin, Weigher in Copper Smelter, employed for 52 weeks, earning $720. ; Mines Dawn, age 25, born in USA, immigrated in 1906, Prospector for minerals, working for 48 weeks earning $1000. ; Norman Lawrence, age 21, born in Ontario, English origin, Worker in Copper Smelter, employed for 40 weeks, earning $500. ; Albert Davies, age 33, born in Wales, immigrated in 1902, Signage painter, Copper Mining Company, employed for 50 weeks, earnings $900. ; Frank McBrien, age 20, born in Ontario, Irish origin, Book keeper, employed for 48 weeks, earning $700. ; Edward Kelland, age 29, Born in England, immigrated in 1900, Electrician Copper Smelter, employed for 52 weeks, $935. ; Philip Goddard, age 47, born in England, immigrated in 1904, Pitman Copper Smelter, employed for 52 weeks, earning $1090. ; James Higgins, age 29, born in Ireland, immigrated in 1910, Caretaker at Clubhouse, employed for 52 weeks, earning $720. ; Hector Bell, age 38, born in Ontario, English origin, Brakeman, employed for 52 weeks, earning $1090. ; William Bull, age 24, born in England, immigrated in 1900, Electrician, employed for 50 weeks, earning $900. ; Edward Garrett, age 26, born in Ontario, Irish origin, Motorman in Nickel Smelter, employed for 50 weeks, earning $840. ; Herman Murphy, age 28, born in Ontario, Irish origin, Brakeman, employed for 52 weeks, earning $1090. From the 1911 Census of 324 Poplar Street, Copper Cliff, McKim Township, Nipissing District Matti Martilla, Head, age 44, born in Finland, immigrated in 1899, his wife Anne, age 34, born in Finland, immigrated in 1899, their children all born in Ontario Fannie, age 10, Lempi, age 8, Walter, age 7, Eno, age 4 and Catharine, age 1; Boarders were Emile Leppiko, age 38, married, born in Finland, immigrated in 1907, Driller Copper Mine, employed 52 weeks, earning $850. ; Juko Laurala, age 20, born in Finland, immigrated in 1910, Framer, Copper Mine, employed 30 weeks, earning $380. ; Leandeo Lehtinen, age 19, born in Finland, immigrated in 1910, Section Labourer Copper Mine, employed 40 weeks earning $420. ; Oska Salo, age 33, born in Finland, immigrated in 1907, Framer Copper Mine, employed 52 weeks, earning $655. ; Jakob Kostila, age 22, born in Finland, immigrated in 1910, Labourer Copper Smelter, employed 40 weeks earning $540. ; Frank Maki, age 21, born in Finland, immigrated in 1910, Labourer Copper Smelter, employed 40 weeks earning $420. ; Olmasi Rantala, age 20, born in Finland, immigrated in 1910, Labourer Copper Smelter, employed 40 weeks earning $420. ; Matti Vuorinsion, age 27, born in Finland, immigrated in 1910, Labourer Copper Smelter, employed 40 weeks earning $420. ; Wrho Jujto, age 21, born in Finland, immigrated in 1910, Labourer Copper Smelter, employed 40 weeks earning $420. ; Ivar Lahti, age 33, born in Finland, immigrated in 1909, Labourer Copper Smelter, employed 40 weeks earning $540. ; Jakob Plevna, age 30, born in Finland, immigrated in 1909, Labourer Copper Smelter, employed 40 weeks earning $550. ; Micpack Salo, age 30, born in Finland, immigrated in 1909, Labourer Copper Smelter, employed 40 weeks earning $550. From the 1911 Census of 270 Poplar Street Jacob Walli, age 32, born in Finland, immigrated in 1899, Crane operator in the Copper Smelter, employed for 45 weeks with earnings of $1130. ; his wife Greeta Christina (Rahkonen) age 33, born in Finland, immigrated in 1900; and their children all born in Ontario, Ida Susannah, age 8, Ossian Edward, age 7, Emile John, age 4, Jacob, age 2 and William 2 months old. Living with them were two Domestic servants Hilma Percru, age 22 and Eta Kotiline, age 21, both born in Finland and immigrated in 1910. Hilma was employed for 40 weeks and earned $90. And Eta worked for 50 weeks and earned $100. There were 30 boarders, all Finnish, 3 were married and one was a widower. Their occupations included miner, labourer and tradesmen, earning from $600 to $925. per year. Jacob Walli died at age 38 of diabetes on January 26, 1917. Charlie Taylor married Margaret Sinclair at Liverpool, England in 1895 and left her behind while he went house-hunting in Canada. 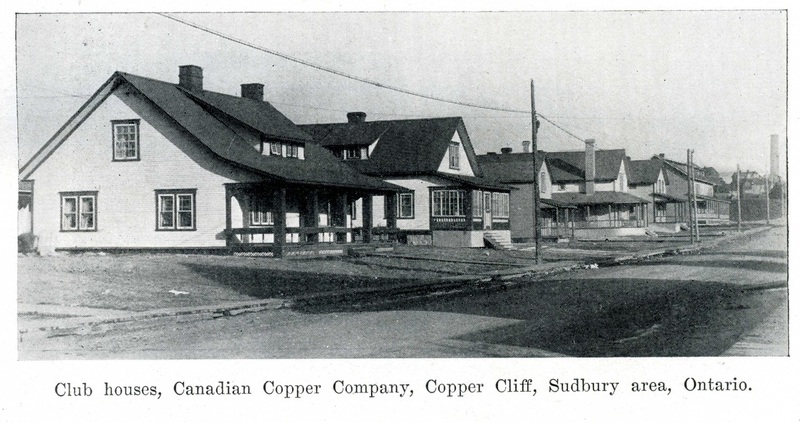 He wrote and told her about a place called Copper Cliff, a mining village in the heart of a dense forest. When she arrived in 1896 there was no station, just a platform where the train stopped to let off passengers and express. Charlie worked at No. 2 Mine. 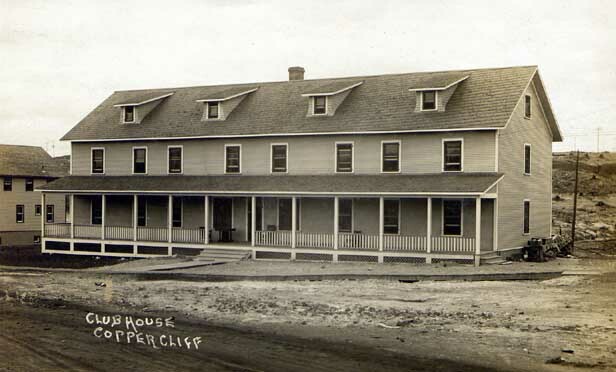 Maggie went with him and managed the company boarding house at Clarabelle, which housed 40 men. Charlie carried supplies on his back from the stores ‘downtown’. During her stay there she fed many a distinguished company official. One day Sir Wilfred Laurier was being shown around. He liked her Scotch scones and a glass of buttermilk. Maggie and Charlie's children were born in Copper Cliff. John Russell Taylor was born February 13, 1898 and died 6 months later. Charles Henry was born in 1899. Albert Edward was born February 8, 1901 at Clarabelle and died at age 1. Daughter Clarabelle Taylor was born February 3, 1903. She was named for Lady MacDonald’s niece for whom the lake was named when its neighboring lake was called ‘Lady MacDonald’. Clarabelle married Vernon Wilfred Biggins. A second daughter Janet Sinclair was born in 1907. Maggie saw a moose while hanging out clothes one day. She thought it was a horse by the way it galloped off. Next day she told Dr. McCauley about the strange beast and he advised her to put out some salt at a certain place every day for a while. Sure enough it came to lick the salt and the wily doctor stood behind a tree to watch it. That is how he was able to shoot the famous Clarabelle moose. In August of 1913 George Millen bought W. Boyd’s boarding house on Serpentine St. in Copper Cliff and began making extensive improvements. He put 36 beds in his boarding house. In December of 1923 Mrs. George Millen received the first installment of $52,000 on a $100,000 legacy from the will of her brother, the late Henry Victor Barrett, of Boston. No more washing the boarders’ blankets or helping in the kitchen for her! 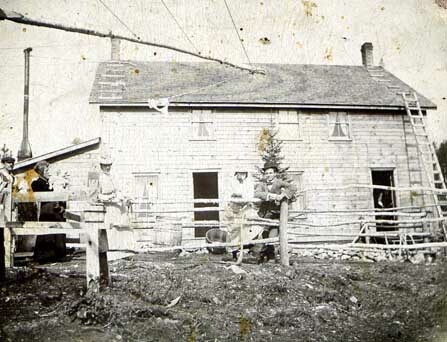 She was the wife of George Millen who ran the Millen boarding house at Copper Cliff. From the 1911 Census of 725 Balsam Street Alfred Levert, age 27, born in Quebec, Lumber scaler at Copper Mine, employed for 52 weeks earning $700. 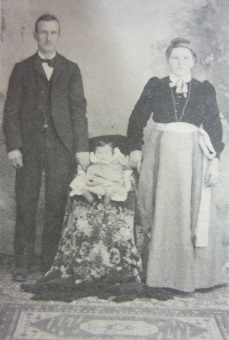 ; his wife Amelia, age 22, born in Quebec, and their son Romeo, age 1, born in Ontario. Living with the family was Olive Halbert, age 16, born in Ontario, Domestic, employed for 16 weeks earning $40. There were 11 boarders, 8 born in Quebec, 1 in Scotland and 2 in England, labourer, locomotive engineer, structural steel workers and tradesmen, earning from $495 to $900. annually. In the East Smelter, John Slivsking, age 26, born in Galicia [historical region in Central Europe that presently straddles the border between Poland and Ukraine], immigrated in 1902, Ruthenian origins, Convertor puncher in Nickel Smelter, employed for 48 weeks, earning $760. ; his wife Vasyline, age 21, born in Galicia, immigrated in 1907; and their daughters, born in Ontario Anna, age 2 and Julia, 9 months. There were 14 boarders, 5 were married, all were born in Galicia, all labourers working in the Nickel Smelter, earning $655. to $740. per year. From the 1911 Census of 76 Gribble Street, Copper Cliff, William McKeen, age 59, born in Ontario, Irish origin, his wife Elizabeth, age 61, born in Ontario, English origin and their daughter Lilian, age 23, born in Ontario, Domestic Dorothy Carter, age 17, born in Ontario, English origin, employed for 25 weeks earning $40. ; George Wilson, age 62, married, born in USA, immigrated in 1891, Irish origin, Labourer with Railway Company, employed for 40 weeks earning $420. ; Richard O’Connor, age 40, married, born in Ontario, Irish origin, Welder in Nickel Smelter, employed for 52 weeks earning $1155. ; Daniel Jessop, age 20, born in Ontario, English origin, Retail salesman in Grocery Store, employed for 22 weeks, earning $300. ; John Bedell, age 30, married, born in USA, immigrated in 1910, English origin, Civil Engineer in Nickel Smelter, employed for 52 weeks earning $2100. and ? Bedell, female age 23, married, born in USA, immigrated in 1910, English origin. From 1918 to 1923 boarding was available at the Central Club, 20 Serpentine Street.